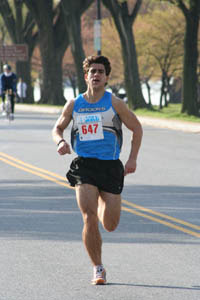 "Well muscled Matias Palavecino (25) of Washington, DC makes the hard charge coming home just short of fifth place by three seconds in 33:18." A few years ago, scientists at NASA developed an interest in the bumblebee. The lab folks reckoned that the little insect held some secrets of flight that may provide answers to questions about operating in space. After all, they asked, how could such small wings produce efficient lift for a relatively large and hairy torso? And how could a round body and flight position that violated many principles of aerodynamics move so effectively through the air? Indeed, there was much to learn from the little hummer. So scientists set about studying the bumblebee to discover its flying secrets. As scientists always do, they hypothesized about, scrutinized, examined, dissected, measured, timed, filmed, observed, compared, quantified, thought about and debated the bumblebee. After weeks of study they came to one conclusion: Bumblebees are not capable of flight. Fortunately, no one told the bumblebee. The silly insects go right on believing that flight is normal for them despite what the best minds in the scientific world know as fact. matias, are you confessing you're a bumblebee..."After all, they asked, how could such small wings produce efficient lift for a relatively large and hairy torso and calves?" I was once described as a "soup can with arms and legs." "Then there's the race horse. Have you ever been to the Kentucky Derby or other big horse race? The physiology of the equine athlete is similar to the human athlete's, and they are trained in much the same manner as a runner. They use heart-rate monitors, train with intervals and endurance, follow a periodization plan and eat a diet designed to enhance performance. Psychologically, race horses differ a great deal from runners. They never question their training preparation. When it comes time for a workout designed by their trainer, they do it without wondering if it's enough. They don't go out in the morning and put in a few extra junk miles for "insurance." They don't worry and fret after poor performances. Stable life goes on as usual. On Derby day, race horses are nervous just as human athletes are; they know what is about to happen, but they don't magnify the tension by comparing themselves with the other horses ("Look at the legs on that stud!"). Instead, they are very purposeful in their approach to training and racing. There is but one reason for every day existence - to get faster. If the horse is physically strong and the trainer is smart, this happens. If you are to succeed in running, the first thing you must do is believe in yourself just as the bumblebee does. Without this, all of the science in the world won't do any good. Also, you must have a purposeful, race-horse trust in your training. Continually second-guessing and changing training direction after every race is a sure way to fail. Think like a bumblebee; train like a horse." Am I a bumblebee? Just one of the many trying to reach their full potential.